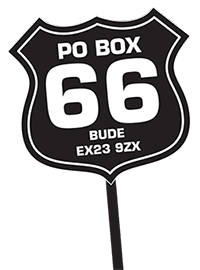 After a few years away from bikes, the family moved to the Isle of Man and with the close presence of the Southern 100, the TT and MGP my addiction was refreshed. The Japanese invasion was well under way but their bigger bikes seemed to becoming very complicated and ‘untouchable’ to my DIY eyes… and my experiences with Villiers left me a bit chary of two-strokes. Then my son got the bug and started a lasting career of salvaging basket cases. 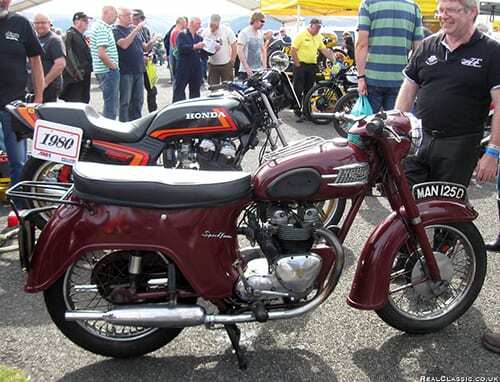 Via a Tiger Cub, B31 and A10 he started road-racing on a Triumph Bonnie – what else? it came with a Morgo conversion, five speeds shoehorned into the four-speed box, fancy pattern sprayed on the fairing through lace curtain etc. 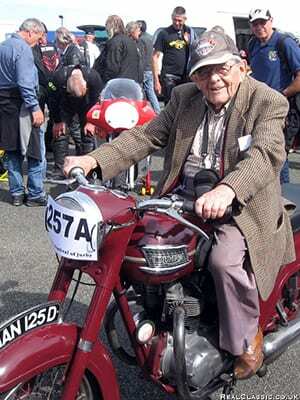 He raced the Triumph for a couple of season before graduating to a Seeley/Atlas. It wasn’t seriously competitive but it was fun and cheap to run whereas the ‘to have’ Yamahas, etc, were a bit fragile and expensive. They seemed to eat rings, pistons, clutches then cylinder blocks in that order, and spares weren’t cheap. We had great fun with the tuning and preparation of the Seeley, all done on a shoestring, and it was fast enough to leave most local opposition standing when racing in the wet due to its great handling. 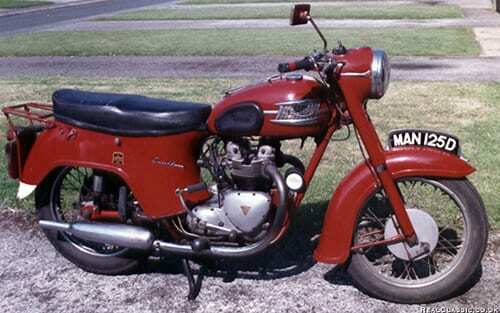 Then I found and bought from a local dealer the bike I’d always fancied in the 1960s. It was a 1959 bathtub 5TA Speed Twin that he’d taken in part exchange which he wanted rid of so I got it for £70. I was able to ride it because of the advent of the full-faced helmet which looked after my eyes. The swinging arm bearings were shot due to lack of lubrication. I was given a re-bushed set off a Tiger 100, but swapping them was an absolute pig of a job. Applying a lot of heat to the frame lug looked a bit of a no-no, so we made an extractor out of two long keel bolts and a six-inch threaded hexagon sleeve and a socket. With plenty of weight on a long lever handle, the spindle came out with loud bangs, about 10 thou at a time. A combination of freezing the spindle and gentle warmth on the lug made reassembly a piece of cake. 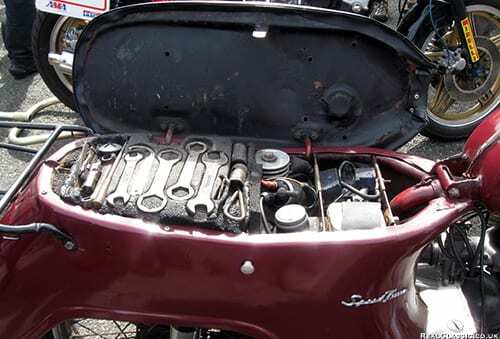 I still have the 5TA, complete with the tool set under the seat. It is due for a major overhaul, but my son keeps flogging it around Jurby on the vintage festival days expecting it to give up but no joy so far. At 78mph (indicated) it still surprises some of the newer stuff on the rough tarmac at the back of the airfield. It became too heavy for me to ride so I had another holiday from biking mainly because most of the current bikes were over-powerful and miles too tall for me. I tried a Honda C90 – very nice but I was not too comfortable with the engine control system and there was nothing between the knees which felt odd. Eventually on my 84th birthday I spotted a Yam YBR125 which I could get my leg over (if you’ll pardon the expression) when it was on the sidestand, and it looked like a ‘normal’ bike without all that expensive plastic. Of course, the brakes and gears were all on the wrong sides but at least the box worked like the Triumph and it had an electric starter. The front brake was fierce. Instead of needing a good handful as on the Triumph it was a case of two fingers. It was nice to be riding again and the only complaint I had of the Yam was about the rather skinny tyres which tend to become directional on the Manx roads especially after resurfacing. Eventually after a couple of years I reluctantly decided to hang up my helmet so the bike has been passed onto my grandchildren, joining the Triumph in my son’s stable. The whole family is a bit addicted to motorcycles, and my grandson was this year’s IoM Centre Enduro Champion – which is nice!